By now you've seen her photo in your news feed. Her skin is a royal river of dark chocolate, the subtle smile on her lips reads as confident and her sparkly prom dress fits like a dream. Seventeen-year-old Tayja Jones posed for a snapshot to commemorate her high school prom forever. And just like any teen, she posted the photo to her social media. The photo went viral because Internet trolls called her horrible names and shamed those who praised Tayja. It didn't take long for the support to come flooding in, deeming Tayja beautiful. (So take that, haters!) But like many other high school girls, Tayja struggles with her self-esteem. And even though folks banned together to combat the haters, Tayja is still picking up the pieces of her broken heart. 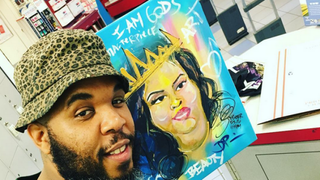 Maryland artist Demont Pinder wanted to make the mending of Tayja's heart a little easier, so he created a masterpiece with her at the center, as a queen. In the painting, Tayja can be seen with that same confident smirk, donning a crown and surrounded by words like "love," "beauty" and "I am God's masterpiece." Pinder posted the final product on his Instagram and urged his followers to help him get it to her. The power of the Internet brought Pinder and Tayja together, and he posted a photo of himself at the post office, sending Tayja her new masterpiece. Pinder said that he painted the picture to show what beauty looks like: "It comes in all shapes and sizes and colors. [You] can't question God's creation." Doesn't this give you all the feels? !